Isolation and loneliness contribute to many illnesses, such as heart disease, Alzheimer’s and dementia. According to Medical News Today, loneliness can alter immune system cells in a way that increases susceptibility to illness and premature death. To combat this, Eskaton, a non-profit community-based organization serving seniors in the Northern California, created its Kids Connection program. The innovative program partners residents at all 27 Eskaton communities with local elementary schools. Creating long-lasting intergenerational friendships is proven to reduce loneliness. 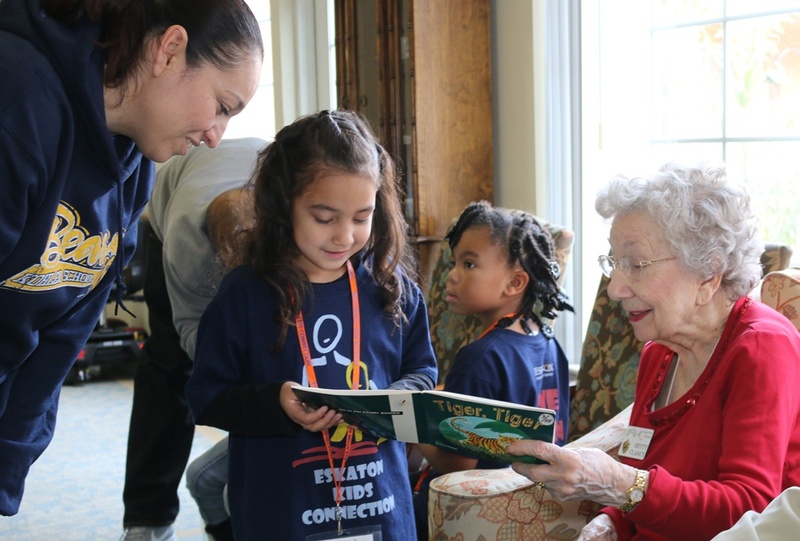 “When a child walks into a room with older adults, the smiles are heartfelt,” said Adam Hill, Eskaton Kids Connection program manager who facilitates relationship building through all levels of care including skilled nursing, assisted living and memory care. “These students are developing new friendships and are involved in activities and experiences they will remember forever,” said Bobbi Donovan, school teacher and co-founder of the Eskaton Kids Connection program. Bobbi along with her sister Betsy Donovan, Eskaton senior vice president and COO, created Kids Connection to provide mutually beneficial learning opportunities, as well as social, cultural, technological and entertainment components for both children and older adults. Eskaton brings more than 650 elementary school children together with 1,000 seniors known as “buddies.” The buddies meet regularly during the school year to read, write, do arts and crafts, play songs and share stories. A third-grader from Kohler Elementary who participates in the program at Eskaton Village Carmichael said, “My favorite thing about my buddies are their happiness.” Kids Connection earned the “Inspire Award” from the Twin Rivers Unified School District and was recognized by The Eisner Foundation for providing mutual respect, sensitivity, socialization, shared knowledge and happiness. Eskaton Village Grass Valley resident Jim Fitch joined the Kids Connection during a 2016 Holiday Party. “At the time, Jim preferred to stay in his apartment, but for some reason he chose to come to this party, and we're glad he did,” said Eskaton Life Enrichment Coordinator Kristen Day. Two boys sat with the United States Air Force veteran and engaged in conversation. 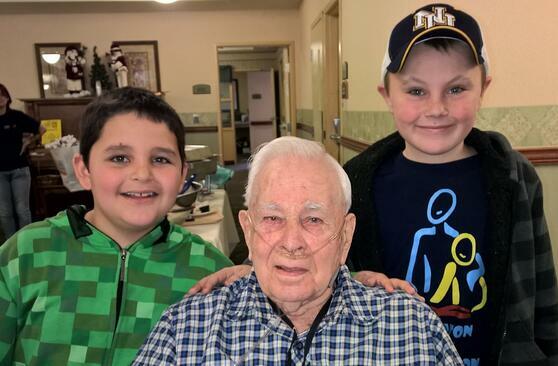 The boys were entranced when Fitch, 93, shared stories of his aircraft and of serving overseas. “When the event was over it was difficult to pry the boys away. A true connection was made that day and it left a lasting smile on everyone’s face," concluded Day. California school districts from Manteca to Mount Shasta, Susanville to Pleasanton, participate in Eskaton Kids Connection. Schools pay nothing for the program, and Eskaton donates the material, transportation and lunch for each visit. Teachers interested in participating in the program can contact Adam Hill at 916-334-0810.